Don’t accost me with your indignant nerd rage or anything, but… I’ve never sat through* an episode of Doctor Who. 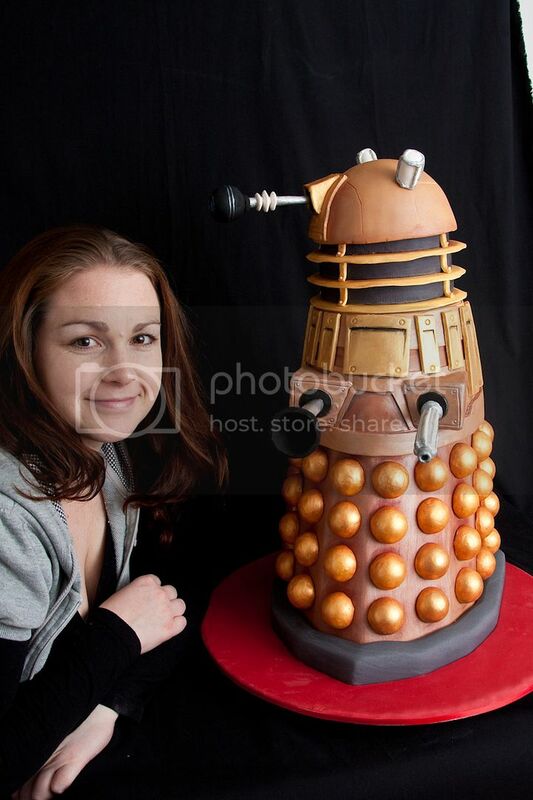 Which doesn’t mean I can’t appreciate a fine cake in the likeness of a murderous mutant robot. This one can even turn its head. Which is, like, the step right before mutant robot cake self-awareness or something. Here we see cake artisan Tenele from Australia’s Stacked Cakes, forced into a subservient position by her 2-foot-tall creation, a carved cherry ripe mud cake covered with chocolate ganache and fondant. Just run behind a closed door, Tenele! It doesn’t have opposable thumbs! Its not a robot!! Its a genetically mutated alien. That’s its outer armor. Idiot. @Elisabeth: Either you’re serious and should be mocked for having a terrible sense of humor, or you’re joking and have a terrible delivery. Either way, I wish you’d stop resenting me for being so much more attractive than you are. It’s a no-win situation. Except for me, of course. That is possibly the Most AMAZING CAKE EVER ! You are a hero to geeks and nerds the world over. This would be such an amazing wedding cake ! You have Never seen a single episode? !